In anticipation of tonight’s matchup against the Terps, we got in touch with Jeremy at Turtle Soup, an excellent site dedicated to Maryland athletics. He was kind enough to answer a few questions we had about their squad, and you can check out out our responses to his questions here. Crazie-Talk: Terrell Stoglin has been excellent so far this season. Other than him, who should we worry about the most? Turtle Soup: Well, it depends on the day. This Terps squad is undermanned and relatively untalented as compared to past seasons. Alex Len has been the wildcard since he was cleared to play in late December. He’s 7’1″ with good agility and nice jump shot. He will absolutely wind up playing at the next level, but he has struggled fitting into the offense. He’s only a freshman and will improve as the season goes on. He sprained his ankle in the Terps loss to Temple on Saturday and is listed as day-to-day. He may not play at all against Duke. The other player to look out for is Sean Mosley. He’s a well rounded player who does all the little things; but has frustrated fans over his 4 year career because he is not a consistent scorer. He’ll score 20 points against Georgia Tech and follow that up with 3 points against Temple. If he gets hot, the Terps are hard to stop. CT: What does this Maryland team do best? Where do they struggle the most? TS: This is easy. With Alex Len in the lineup; the Terps can be elite rebounding team. For the first time in years, the Terps can simultaneously play a frontline of three players taller than 6’9″. James Padgett (6’8″) and Ashton Pankey (6’9″) are both good rebounders who become more effective when Alex Len is occupying defenders. In terms of struggling, the Terps are a dreadful free throw shooting team. They are averaging an FT% in the low 60s but it is so much worse than that. The misses come at the worst possible moments. I can point to at least 3 losses where the outcome would have been different had the Terps knocked down their shots from the charity stripe. The most frustrating aspect of the woeful FT shooting is that the Terps are getting to the line a TON. They just aren’t converting those opportunities. CT: Gary Williams will be in the house on Wednesday tonight. How has Mark Turgeon done in his first year in the post-Gary era? TS: Terp fans LOVE Mark Turgeon. The guy can coach. He has won everywhere he has been. He took Wichita State to a Sweet 16 and then led Texas A&M to 4 straight NCAA Tournament berths. We was the point guard on the 1988 Kansas Jayhawk team that won the national title so he knows how to flat out win. The Terps are lacking talent but it is easy to see that he runs good sets and make the most of the talent he has. Often, it is the little things like beautiful plays that lead to lay ups coming out of a time out; so Terp fans can tell he is going to be good. Gary Williams loves him too which is always a plus. I honestly think in 5 years that MD fans will be glad the Sean Miller stayed at Arizona. TS: This season, Maryland is not in Duke’s class. 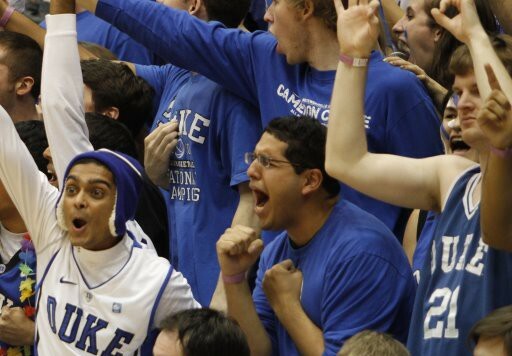 However, the Terps do play tough at home, and you know the crowd will be fired up for Duke. The additional element of the court being named after Gary Williams will only increase the emotional intensity. If Alex Len plays, I think the Terps have a 50/50 chance of pulling the upset.